Earlier: But where is the Snuggie for cats? I put grated ginger (use a zester or chop finely) in my tea every day. Good for everything. Also works in chinese stir-fry dishes, squash soup… it’s an aromatic, which i think means it has a lot of flavor, use sparingly. Basically anywhere you might put onion and garlic, ginger would go well also. 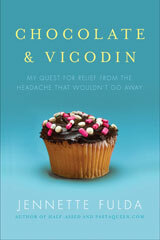 PS – when I wrote ‘good for everything’ i meant that it has a lot of health benefits, including you-know-what. But especially in winter, good for throats. Ground ginger is yummy in curries! My dad just sautés bok choy with a bit of butter…it’s pretty good too. Whatever you do – do NOT eat a chunk of ginger!!! You will regret it! Skin a chunk, grate it or mince it, and then use it in a stir fry. There is a million and one ways to cook with ginger but that is the easiest. For a 3-4 serving stir fry I would probably add 1 tbsp of minced ginger and that would add A LOT of flavour. BF says the most string spice I cook with is ginger. If added in moderation it just has a fresh taste, but if you add a lot it will add heat! Ginger is delicious – and as noted above – it’s a very strong flavour, so use sparingly. You’ve got enough there to last a long time. On the plus side, it freezes well – no need to do anything, just throw it in the freezer. When you need some, just peel the part you want to grate with a knife or peeler. Both are good in stir fries, though go easy with the ginger (chopped finely). That’s my problem with vegetable boxes: their choice, not mine. I made this recipe recently that has bok choy and ginger and was DELICIOUS! You need to peel the ginger and then grate it or finely chop it and as people have said, a little goes a long way so you will have a lot left over. I think I remember that Rachael Ray keeps the rest in a baggie in the freezer for the next time she needs it. We use it in salad dressing, stir fry, and marinades. Bok choy, I think is best sauteed or grilled (can use a grill pan). I tried to steam it once and it just got very slimy. There is a restaurant here in San Francisco called Pacific Catch that uses baby Bok Choy in their teriyaki salmon rice bowl. It is grilled and DELICIOUS! crunchy and a little sweet. After the thighs are in the oven, put the remaining ingredients in a saucepan, stir and bring to a boil. Simmer for about 3 minutes to reduce sauce. Continue baking for a total of about 60 minutes, turning chicken two or three times. This is great over brown rice. The lemon slices are my favorite part. That’s a lot of ginger to use up. If you don’t find enough recipes to use it all, it freezes well. This recipe from Real Simple has become a family fave. Uses bok choy and ginger and even the kids like it. Super easy, but SUPER flavorful. Here’s an idea from the lovely Vegan Yum-Yum. You could swap out the tofu for chicken if tofu’s not your thing. I love ginger! I put it in my fruit blends for a little kick. I also make tea by washing off about 5 pieces and just boiling them in water. This works great for chest congestion. I have never tried bok choy but this recipe makes me want to. With the ginger you should peel it first and then you can grate it or chop it and use it in salad dressings or stir frys. I also like to mix soy sauce, ginger and a little stevia to make a marinade for salmon. Yum! I agree with Sarah though – DON’T EAT A CHUNK PLAIN. It’s WAAAY too intense! Forgot to mention a tip I got from the annoying Rachael Ray. I don’t use ginger a lot so when I buy a nub of it and use some, the rest often goes to waste. Rachael suggests keeping the peeled finger of Ginger in the freezer and grating it right into dishes when you need it. It’s too bad it didn’t show up while you were still unwell from your flu shot, it’s supposed to be good for nausea. I like bok choy with other veggies stir fried over rice. My favorite ginger containing recipe is for Tom Ka Gai (which is thai chicken and coconut milk soup) but you need a bunch of other special ingredients to make it. Hope you find something really tasty to make. I would just use both in stir fry. A friend gave me HER bok choy from a produce box like yours and I think I made something similar to your balsamic vinegar bok choy recipe and I wasn’t impressed. I determined that if I ever had it again, I would just stick it in stir fry and get the health benefits but that’s about it. It was pretty bland if I recall. I use ginger in a lot of things. I am lazy and just buy the jar of minced ginger though. My most common use for ginger would be my broccoli slaw teriyaki wraps that are on my blog. We make those weekly here. Hey, you probably could make those wraps and stick some shredded bok choy in there too. They are delicious!! Have fun with the new veggies! I use two or three slices of ginger in my cranberry sauce (after peeling). If something is going to cook for awhile, I think just throwing in a few slices is enough, without grating or chopping. Then remove before eating, like a bay leaf. Fresh is so much better than powdered! I always keep ginger in the freezer for stir-fries and many other Asian and African recipes. Technically you’re supposed to peel it, but I usually just grate it with the skin on, and I’ve never noticed a bad flavor or texture. Bok choy is great in stir-fry and Asian soups. My suggestion is to stir-fry the bok choy in some butter or olive oil. Do the stems for about 5-8 minutes, then add in the leaves (they don’t take as long). I like them with just a little salt as a side dish for “Asian night” at our house, but they’d be good stir-fried with other veggies, too, I’m sure. That is a LOT of ginger. I’d follow the suggestion of peeling them and freezing them for when you need a couple of grates. We got through a hunk of ginger once a week – I put it through the juiceer in my carrot juice and also in my morning smoothies (though even the Vitamix can’t chew through it completely. PS It doesn’t compost). I would grate it really fine if using in a stir fry as it is strong! I LOVE bok choy and grew up on it. The key is to rinse it really well as the part close to the bottoms can collect dirt, like leeks. It takes no time to steam in, say, a rice cooker. It has a very mild flavor, but it’s a great holder of sauce. I’m not a good cook so I wouldn’t know what to do with that stuff. I’ve only had bok choy at the Chinese food restaurants and use ginger sause for my scallion pancakes. I’m looking forward to hearing what you do with this stuff. Good luck! I usually add steak to that last one. ginger is great in water – I peel it, slice it into rounds and put a few pieces in a mug with hot water. Supposedly it is good for an upset stomach. Stir-fry is definitely the way to go. I have also heard about another use for ginger I want to try – ginger milk. Cut off a one in piece of ginger, peel it, put it in a mug filled with either sweetened soy milk or milk with a bit of sugar in it and simmer it for a few minutes. Ginger is really healthy – good for the immune system and great for intestinal problems. Cut half of ginger into very fine matchsticks (less than 1/8 inch thick; about 1 tablespoon) and reserve. Grate remaining ginger and squeeze pulp with your fingers to yield 1 teaspoon liquid, then discard pulp. Remove any bruised or withered outer leaves from bok choy. Trim 1/8 inch from bottom of each bok choy, then cut each head into quarters. Wash bok choy in several changes of cold water and dry in a colander or salad spinner until dry to the touch. Whisk together ginger juice, chicken broth, rice wine, soy sauce, cornstarch, salt, and sugar in a small bowl until cornstarch is dissolved. Heat wok over high heat until a bead of water vaporizes within 1 to 2 seconds of contact. Pour oil down side of wok, then swirl oil, tilting wok to coat sides. Add ginger matchsticks and stir-fry 5 seconds. Add bok choy and stir-fry until leaves are bright green and just limp, 1 to 2 minutes. Stir broth mixture, then pour into wok and stir-fry until vegetables are crisp-tender and sauce is slightly thickened, about 1 minute. Remove from heat and drizzle with sesame oil, then stir to coat. Ginger is the new garlic. Once you start using it, you’ll wonder how you survived those pre-garlic days. Its digestive properties are incredible. You’ve received some great advice already. It’s a great addition to perk up chicken soup and as a tea. 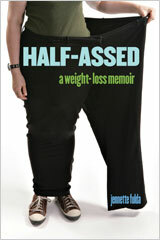 Also – I am in the process of re-reading your book, and am enjoying it even more the second time! So inspiring! I highly recommend that you significantly cut the amount of chili powder that they say to use. Bok Choy is great chopped and steamed with a little chicken broth if you want something simple! @Vicki – I was about to suggest the same. It looks awesome. I don’t think it’s necessary to peel the ginger; I’ve never done so. I wash mine, dry it with a paper towel, and put it in a double baggie in the freezer, as it will go bad fairly quickly in the fridge. Then I just grate it for use as I go, it’s easy to grate while frozen. I use it in marinades for meats or fish and as an ingredient in salad dressings or soup. As someone else mentioned, I would compare it to garlic – in the way it’s used, not in flavor. Ginger, like cilantro is one of those flavors that you either love or hate. I love it, but those who don’t often say it tastes like soap. It’s super rich in flavor and very very good for you (anti-oxidant etc). Clean and chop stalks into bite-size sections. Get a large pot, add a couple tablespoons of oil (olive oil to sesame oil for added flavor) heat the oil then add the bok choy, fry until over medium until tender (soft, but still has a bit on crunch). Add rooster sauce to taste. http://www.huyfong.com makes the rooster sauce. You can freeze the ginger root in a ziploc bag if you can’t use it before it goes bad. I grate mine straight from the freezer when I need it for a recipe. Great to add to soy sauce and minced garlic for an asian marinade for chicken or pork tenderloin. A tip about ginger… it’s very woody and the skin is very thin. The easiest way to peel it (the skin is inedible) is to scrape the skin off with the side of a spoon. I made a simple dipping sauce for dim sum (chinese dumplings, egg rolls, etc.) which is grated ginger, a drop of toasted sesame oil, a small spoonful of garlic chili paste, soy sauce and rice vinegar… also use as salad dressing for cabbage, chicken and scallion salad. I also love love love ginger and put it in almost anything. As folks have said, if you put onion or garlic there, ginger usually works out okay. I like to put some in any sort of tomato based sauce/soup to give it a little zing. Otherwise, everyone else covered the things I wanted to say! Some type of stir-fry all the way! I love stir-fry bok choy! Ginger can and SHOULD go on everything. Grate it up and put it on chicken, meet, potatoes, everything. YUUUM! My best friend’s mom swears by ginger root tea for nausea and motion sickness. Lots of people have mentioned ginger in stir fries, but it is often an essential ingredient for South Asian curries as well. It’s often added, either julienned or finely diced, near the end of cooking with fresh chilli and fresh coriander leaves. Some recipes also add it at the start with the garlic after the onions are browned. I also like to add a slice, unpeeled, to tea. Apparently ginger and fenugreek is a good tea when suffering from sinus infections/headaches as it can help clear then out. I just use a few dried fenugreek seeds with the slice of ginger in any kind of tea. I also use it when poaching chicken breasts, just throw a couple of slices in the poaching water with some soy sauce. I rarely bother to peel it, especially if I am using it grated either fresh or straight from the freezer. No one, including me, has ever noticed the difference. You can also use the bok choy anywhere you would use cabbage, such as a slaw. And I like it in chicken/egg drop soup. But my favorite is steamed and topped with a little butter or sesame oil or olive oil, like someone (Kristen?) said. Slice a really thin piece of ginger and put it on top of a chunk of dark chocolate…fantastic! It looks like you’ll have a lot of fresh ginger left over. It’s a really good way to give a different taste to your water. It’s very subtle but just put several peeled slices in your water pitcher with some mint leaves and it’s absolutely refreshing after coming home from the gym! Pumpkin soup with grated ginger. Put boiled pumpkin and boiled tomatoes in the blender. May be also one boiled apple too. Add 1/2 cup of sour cream and grated ginger. Salt and pepper. The more ginger, the hotter it’ll be. Add water from the boiling until the desired degree of “liquid”. of course I don’t mean 1/2 cup of grated ginger!!! 1/2 cup of sour cream and a little bit of grated ginger. grate about a tablespoon of ginger into a blender, add the flesh of one peach, one whole peeled orange and a handful of ice. Blend for the best smoothie ever. This is my favorite smoothie. You can also add a scoop of protein powder for a great breakfast. The smoothie is icy cold with a shot of heat from the ginger. you can sweeten with some sugar substitute if you need to – depending on how ripe the fruit is. Just awesome. Mmm – two of my fav. ingredients. I use ginger in stir-frys and with chicken. Also good with soy sauce, garlic to marinate pork tenderloin or chicken (or any meat, really). That is a LOT of ginger! Probably enough to use in a couple DOZEN recipes. Bok choy, yeah, easy, just stir fry or use like any other green type of leafy thing. Chop the pepper and garlic, and grate the ginger. Put in a small food processor with the soy sauce, white wine, sesame oil, and cilantro. Whir until blended. Pour the sauce over the fish, rubbing it in a little. Bake for about 8 minutes, or until the fish flakes easily and is cooked through. It will be very moist and gelatinous, still. Serve immediately over brown rice, garnished with scallions and cilantro. I don’t have anything to add to the delicious recipes above, but just wanted to ask you to let us know how it turned out for you. (I hope you like the taste of stir-fried ginger — at first it seemed odd to me, but now it’s one of my favorites). I think quite a few people have mentioned the freezer tip. what I really like ginger in is Indian lentils. I have a recipe which cooks lentils with spices (including grated ginger) and spinach. So healthy and so so good! Sorry I don’t have the recipe typed up but if this sounds interesting to you email me and I’ll send it to you. 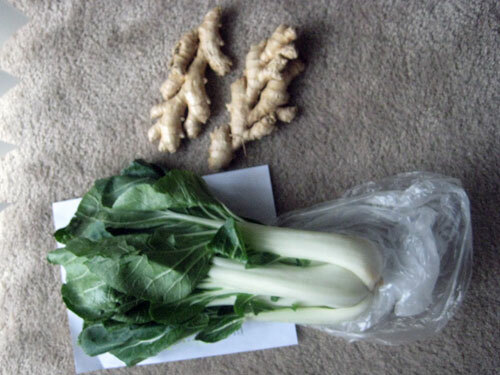 I love ginger & bok choy. Then again, I kinda grew up with them, being Chinese and my mom tends to use both bok choy & ginger a lot. Freezing the ginger is a good tip. I like my ginger in tea, especially when I’m sick or my stomach acts up. I have to admit that I tend to use baby bok choy instead of the “regular” bok choy. The baby variety is smaller (duh) & more tender. Also, much quicker to cook & doesn’t really require cutting up. I like to eat them steamed with oyster sauce on top (check the Oriental aisle at your local supermarket). Definitely peel the ginger before freezing the chunks. Then just grate into your dish as needed. A microplane is the way to go to grate ginger. Coat a large nonstick skillet w/cooking spray and set pan over medium-high heat. browned and onion is soft 5-7 minutes. bok choy is wilted and pepper is tender-crisp about 3-5 minutes. Spoon 1/2 cup of beef mixture into each lettuce leaf. 2 filled leaves per person. Serve w/extra soy sauce if desired. *NOTE: IT may be helpful to add 1-2 tsp. of cornstarch to the recipe, to thicken sauce. Whisk together about 2 Tbs. of soy sauce, the juice of half an orange, 1 clove of minced garlic, 1-2 tsps. of minced ginger, a little bit of honey, and some olive oil. Add a few red pepper flakes for heat if you like. Don’t store the ginger in the fridge, and by all means do NOT put it in plastic on your kitchen counter or it will mold fast. I just store mine naked on the counter; the cut end will self-heal and then you can just cut that little end off when you are ready to eat more. Bok Choy and ginger go well in a stir fry with green onions, bamboo shoots, and sauce. For the sauce, use 1 or 2 Tbsp soy sauce, 1/2 Tbsp sugar, 1/2 tsp salt, 1/4 tsp or more fresh ground black pepper (that’s a key flavor along w/ the bamboo shoots), and about a teaspoon of corn starch dissolved in about a Tablespoon of cold chicken broth or stock. Stir fry the green onions (lots) with about an inch or two of ginger, depending on how much you love ginger, then add the bamboo shoots and the chopped up (bite size) boy choy, then add the sauce and make sure it cooks just barely enough to boil and “set” the corn starch to thicken, then turn the heat off right away and serve. Oh, P.S., I tend to like cutting my ginger in 1/2 to 1 inch long really, really thin strips, but if you are a ginger newbie and find it too strong, mince it really fine instead — although then you will find it tends to brown too fast, in which case, turn the heat down a touch. One of my iguana’s favorite foods is bok choy. Trust the lizard’s taste, hehe. Dice about a tablespoon of ginger up, and throw it in a wok with sesame oil, a few cloves of diced garlic, and some soy sauce. Add bok choy and just about any other veggies you like (I usually do broccoli, carrots, celery, bok choy, baby corn, water chestnuts, and bamboo shots). Best garlic tip: peel it using the side of the spoon. Veggie peeler or knife are too akward, the spoon is magical. I vote for stir-fry, best way to eat bok choy. I love this recipe http://www.foodnetwork.com/recipes/tyler-florence/teriyaki-sauce-recipe/index.html that includes fresh ginger for Teriyaki Sauce from the food network, you can stir fry anything with it. Tyler Florence also has a stir fry recipe using bok choy and you can use the freshly whipped up teriyaki sauce in it. P.P.S., I can’t believe I forgot the Rice Wine in my recipe. I thought I had it memorized, but when I got home from work I checked the recipe and there’s actually no soy sauce in it — instead, there’s a tablespoon of rice wine. The original recipe is for mustard greens which are best, but it’s also good with baby bok choy. I haven’t tried it with the bigger bok choy. Being Chinese, my father always favored the baby bok choy. I have two nice boik choy recipes linked on the sidebar of my blog’s front page. The bok choy with cashews recipe is GREAT. As for ginger root, it keeps for a long time in the fridge. I use it in chicken soups. I take a few slices, simmer it in the soup (I do homemade, but if you have a cold and want to simmer it in premade soup, go for it) and then fish out the slices (to pungent to eat). Its good for you. I also make ginger tea by putting a slice or two in boiling water, steeping a bit, and adding honey. Great for a cold or for digestion. There’s nothing like the smell of fresh ginger. You can store it in your freezer too, so while it looks like you didn’t get very much, it’s actually going to last a long time! I have no clue about the bok choy but slice that ginger up and throw it in a stir fry! I bet the bok choy would work in that as well. Make some (brown) rice and then saute on high heat whatever you want: chicken, broccolu, bell peppers, carrots, ginger, bok choy. Throw on some soy sauce and viola. Healthy and delicious. I’m laughing out loud (LOL-ing) at work, and hoping you post a picture of yourself with the ginger root taped to the headband and your nose painted red. You are great! Thanks for making me laugh!